To cook a perfectly hardboiled egg, place the egg into a small pan, cover with at least 3 cm of cold water and a large pinch of salt. Place the pan on a high heat, and as soon as the water comes to a rolling boil, turn down to medium and simmer for 8 minutes. Immediately remove from the water with a slotted spoon and place into a bowl of iced water. Once it has cooled, remove the egg from the water and tap all over on a hard surface. Gently take off the shell, holding it under a running tap of cold water to ease peeling. Slice thickly into 4 and set aside. Cut the avocado into 4-5 slices, squeezing over a little lemon juice to stop it discolouring. To assemble, start by spreading Philadelphia onto both Ryvita slices. 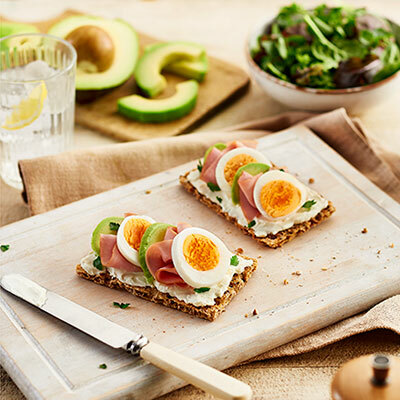 Then lay a slice each of ham, egg and avocado, alternating between each so as to form a pattern. Finish with a sprinkle of finely chopped parsley and serve with a mixed leaf salad, drizzled in a little olive oil and a squeeze of lemon juice. This recipe is also tasty with Philadelphia Lightest.